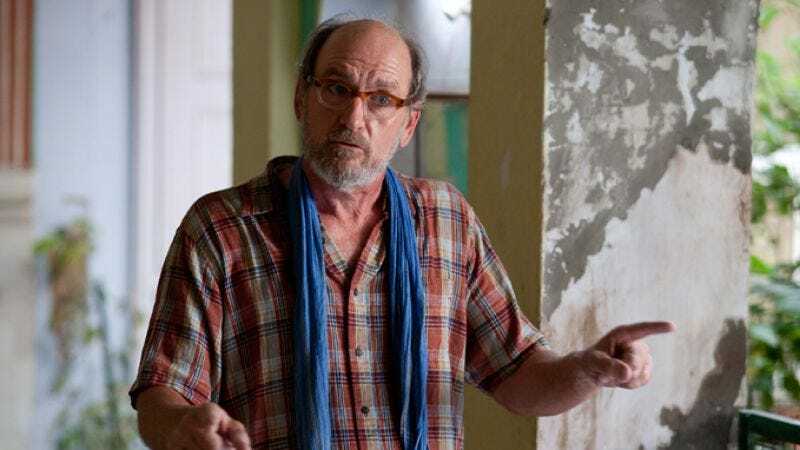 The actor: Veteran character actor Richard Jenkins built his career on secondary parts for decades before landing his first leading role—and a subsequent Best Actor nomination—as a whitebread college professor turned African drum player in 2007’s The Visitor. Jenkins is otherwise perhaps best known as Nathaniel Fisher, the deceased-yet-looming patriarch of the Fisher family on Six Feet Under, but consistent gigs with the Farrelly brothers (There’s Something About Mary; Me, Myself & Irene; Say It Isn’t So; 2011’s Hall Pass) and the Coen brothers (The Man Who Wasn’t There; Intolerable Cruelty; Burn After Reading) have elevated his status above a mere ubiquitous Everyman actor. He currently stars in the Julia Roberts feature Eat Pray Love, as a spiritual-seeking Texan living in an Indian ashram. Richard Jenkins: I auditioned for this really great part, and I remember my manager called me up and said “You got it! You’re Kelly.” And I said “Who?” “Kelly.” I searched through the script, and I was in two scenes. I said “Howdy” in the first scene, and in the second scene, I said “You can’t do that,” and they shot me. And I was on the set for seven weeks. It was a cover set, which means if they couldn’t work outside with it snowing or bad weather, they would move inside and do that scene they were saving for bad weather, so I couldn’t go anywhere. I was hanging out in the Hilton Hotel in Santa Fe, New Mexico, and everybody else was working on the movie. The A.V. Club: That was an enormous cast—Kevin Costner, Jeff Goldblum, Kevin Kline, Danny Glover, John Cleese. Does having that many stars around affect a relatively young actor? RJ: Well, I wasn’t actually that young, I was in my 30s, and I’d been kicking around awhile. But it was a huge movie. It was in the middle of New Mexico. No matter where the camera pointed, you wouldn’t see any civilization. It was amazing. Linda Hunt took pity on me and took me out to dinner, and I thought that was nice. AVC: How much of Step Brothers was improv? RJ: The question is how much of it wasn’t improv. Adam McKay would say “I’d like to do it as written a couple of times, and we’ll jump off.” I’d say “A couple? We haven’t got through it once.” It was unbelievable. AVC: Did you have any improv experience beforehand? RJ: No, you’d do it in films sometimes, but not to the extent that [Will Ferrell and John C. Reilly] had. They’ll go anywhere, and you’ll just find yourself watching. But Adam McKay was so supportive, you didn’t feel a lot of pressure like you had to produce something every time. There was no right or wrong. Mary Steenburgen is terrific at it. AVC: Is it easier to play the straight guy when you’ve got these zany characters around? RJ: Well, you’re not going to be funnier than those two guys. It was a world to which I was not familiar. AVC: When you’re shooting a role like that, do you have any indication that it could be Oscar-worthy? RJ: No, you feel like “Why is that guy on the set? Are they going to fire me?” No, heavens no. You never know if it’s any good until people respond to it. You know how it feels when you do it, but there’s so many things involved. The thing you do realize is, if the movie isn’t any good, then it’s your fault. That’s what you think about. AVC: That was your first leading role. Is the added pressure that noticeable? RJ: Yeah, if I was going to do it, that was a great circumstance to do it in. I’d been acting for years and years, and I had done leading roles onstage, so it’s not like I was thrust into this at 18. We rehearsed for three weeks, we got to know each other and become friends. By the time we started to shoot, it felt good. But I do understand now, there’s a difference with carrying a movie that most character actors don’t have. AVC: How much training did you do on the hand drum? RJ: I didn’t. I played drums when I was young, so it gave me a leg up. Or a hand-up. RJ: I was at a real funeral once, around the time I was doing Six Feet Under, when a woman tapped me on the shoulder and asked “Are they filming this?” It was one of those things where you’re thinking “Is she kidding, is she not kidding?” She wasn’t. That was jaw-dropping. AVC: Did you do any mortician research before taking the role? RJ: I read a book called The Undertaking: Life Studies From The Dismal Trade, and it’s written by a poet mortician about his job. A fabulous book. So I kind of based the guy on this character, who felt he was doing a service and not a money-grubbing thing, trying to sell you the most expensive coffin or whatever. There was really a need for funerals. I liked that idea, so I thought of Nathaniel as a humanitarian, a little bit. RJ: Bobby and Pete [Farrelly], they cast all their friends. The most incredibly loyal people I’ve known. They have friends from when they were 2. Once you’re their friend, they’re your friend. So they hire them all as extras in the movies. We were doing Me, Myself & Irene, Chris Cooper and I were chasing Jim Carrey through a crowd of people at a train station. I’m running through this crowd, and they’re supposed to get in my way. And somebody grabs the back of my shirt, tugs on it. I turn around and this woman is looking at me and says “I went to school with Bobby.” “What?” [Laughs.] Cut. RJ: [Joel and Ethan Coen] are two of the easiest guys in the world. They move quickly, they know what they want, and they want you to contribute something to the role. They don’t talk about their work much. I played the part of the gym manager [in Burn After Reading], and I got a call once on my cell phone from Joel and Ethan, they said “Uh, Richard, could you work out before we start the movie?” And I said “I already do.” And there was a pause. Then they said “Could you lift weights?” And I said “I do.” Another long pause. They said “Never mind.” [Laughs.] I guess I didn’t look like Arnold Schwarzenegger. AVC: How do you become part of the Coen family of actors? RJ: My first really nice part after Silverado. And my first day of shooting, they wouldn’t let me on the set, cause they didn’t believe I was in it. We were shooting in Massachusetts, and I drove up from my house, and I didn’t have any ID on me or anything. I just drove up to the gate, and said “I’m here to shoot the movie.” The guy said “Who are you?” I said “I’m an actor,” and he said “Yeah, you and everyone else in town.” I said “No, no, I’m an actor.” And one of the grips or crew guys was walking by, and the guard asked “Hey, do you know who this guy is?” And the guy looked at me and said “Never seen ’em before.” Finally I got an assistant to say “Yeah, yeah, he’s in the movie.” You think it’s hard getting into movie sets? It is. AVC: You’re in the trailer for about three seconds, lunging at Julia Roberts. RJ: That’s basically the entire movie, is me lunging at her. She counters and parries, and I lunge again. No, it’s actually based on a real guy, his name is Richard from Texas, that’s what he’s known as in the book and in the movie. It’s a guy she met in the ashram in India, and they became best friends. He’s really an interesting cat, this guy. He was a construction guy from Texas. Had a lot of hard times in his life. Put a lot of stuff in his body that he shouldn’t have, and turned it around. Began going to these ashrams and meditating and doing the work. And he just died, actually, maybe eight to 10 weeks ago. AVC: Did you talk to him beforehand? RJ: In my later years, I’m doing vampire movies. The Cabin In The Woods is a Joss Whedon, Drew Goddard deal, a new take on a horror film. I never thought I’d be doing this stuff, but it’s interesting. AVC: You’re also in the American Let The Right One In remake. What is it about this stage in your career and vampire movies? Just a coincidence? RJ: I’ve no idea. Probably. Either that, or I look like the undead. AVC: How much work have you done in horror? RJ: I’ve never done horror. This is a whole new world to me. But I’ve always loved those pictures of Hollywood in the ’50s, of people coming out of the commissary on the Warner Bros. lot dressed like Roman soldiers, eating sandwiches and smoking a cigarette. And on this movie, you’ll have monsters sitting at the craft-service table eating a sandwich. It just cracks me up.